Back to the Basics. 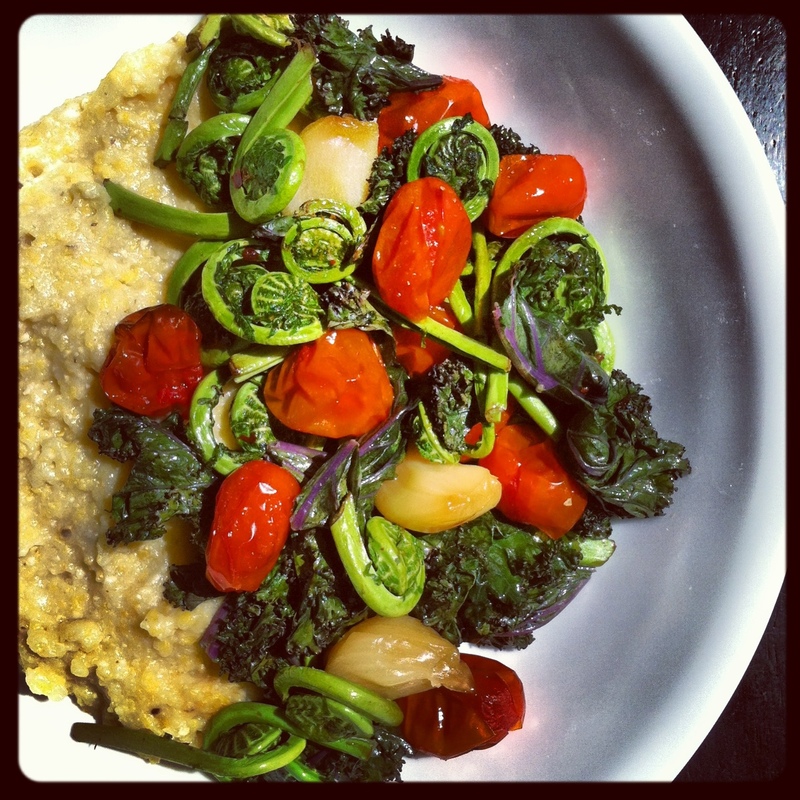 [polenta & lemon roasted vegetables] | Eat More Plants. 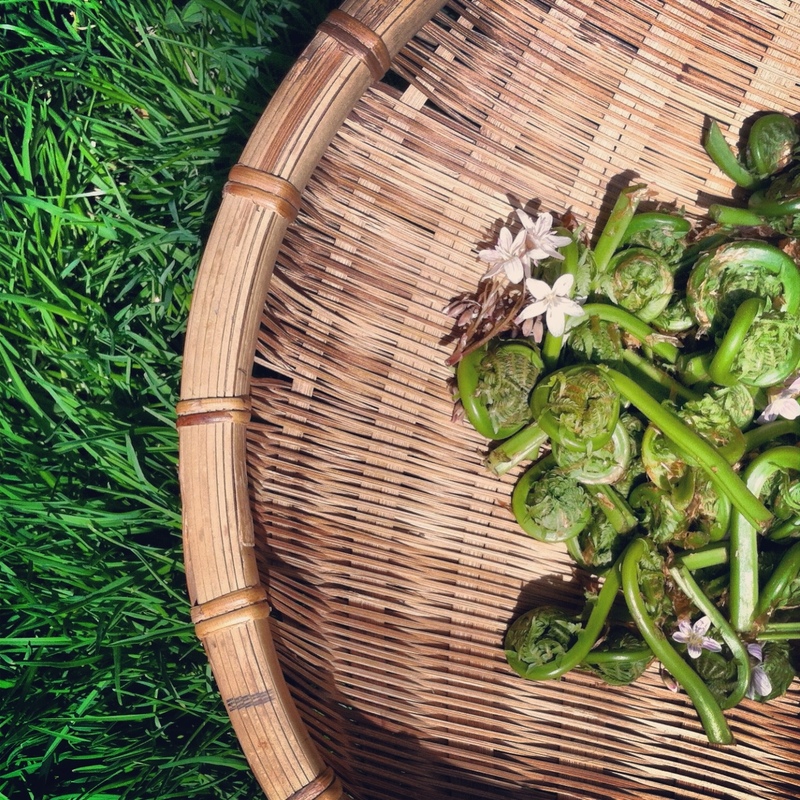 We went hiking yesterday and foraged these beautiful fiddleheads. I wanted to make something to showcase their mild flavor and I thought a bowl of creamy polenta with roasted garlic & lemon veggies would be great. Making polenta is undoubtedly a pain (literally) but it’s so worth it in the end. Make sure you have 30-40 minutes free to attend to your stove because you won’t be able to leave your polenta once it starts cooking. Constantly stirring is what keeps it from burning on the bottom. You can roast whatever vegetables you have on hand; I happened to have grape tomatoes and red kale. Bring water to a boil in a heavy bottomed pot. Slowly pour corn meal in while whisking to prevent clumps. Reduce heat to low and begin stirring. The polenta will take about 35-45 minutes to thicken completely. When the polenta starts to pull away from sides of your pot it’s most likely done, or almost done. Add in butter and nutritional yeast, stir to combine. Any unused portion should be left out to cool and then stored in the refrigerator. Remove the outermost white skin from a whole head of garlic, leaving the head shape and individual clove skins intact. Slice off the top 1/2 inch of the head. Rub with a few teaspoons of olive oil. Wrap in foil and place in the oven. Roast for 30 minutes. Check garlic at 30 minutes. You’ll see the garlic get soft and golden in color. Pour a few teaspoons of olive oil on a sheet pan. Roll some cherry or grape tomatoes around in the oil to cover them and sprinkle with salt. Place a lemon half, cut side down, on the sheet pan as well. The juice of the lemon will slowly come out, mixing with the tomatoes and oil. Roast for 10 minutes, give everything a toss and roast for another 10, or until they are roasted to your liking. Squeeze the roasted lemon over your veg when you’re done roasting. Blanch in boiling water for 1 minute, rinse with cold water. Repeat. This removes some of the bitterness and any debris that is on your fiddleheads. You can eat them like this or throw them on your roasting pan with the oil and lemon for a few minutes, 3-5 minutes should suffice. I like to finish this dish with a little balsamic and fresh thyme. My mother and her (now ex) boyfriend used to forage for fiddleheads. Such an interesting taste they have! And I’m obsessed with polenta, just a bit scared to make it. Although this dish and the colors may force me to give it a try.